True spinach is an annual, green leafy plant. Better known as a cooked vegetable, the young leaves, or baby spinach, are also used raw in salads. Leaf beet, or perpetual spinach, is much easier to grow than true spinach. The related chards have larger, often brightly colored, leaf stalks that make striking ornamental plants for containers or borders. Further afield, most parts of the world have different crops cooked as a spinach, many of which you can try in your garden. As it is an annual, true spinach will bolt or run to seed in the first season. Some varieties claim to be resistant to bolting, but in a Gardening Which? trial, all varieties sown in March had run to seed by June. True spinach is best sown in succession through the summer and cut when small, before it starts to bolt. Leaf beets, including the colored-stemmed chards, are biennials and are less likely to bolt in the first summer. They are best sown once in spring and the leaves harvested regularly. True spinach is usually cut when it reaches a certain size and will not regrow. Pick when leaves are 5-10cm for eating raw in salads. For cooking, let it grow to 15-20cm. You need to collect a large amount of leaves, as they condense hugely in the cooking process. Wash the leaves thoroughly, pack them into a pan without adding water, cover and cook over a low heat until they have softened. Leaf beet grows very fast, producing large leaves. Pick the outer leaves regularly when they reach 10-15cm, allowing the central leaves to continue growing You can also cut the whole head about 2cm above soil level. The plant should re-sprout. Leaf beet will continue growing all summer and can be picked over regularly. Older, larger leaves can be cooked, but remember to strip out the tough midribs first. Chard leaves can be picked very small for salads or cooked like leaf beet. The leaf stalks are also edible. They can be cooked with the leaves when small. Larger stalks are best separated from the leaf and steamed or boiled as a separate dish. The colored-stemmed types are particularly appealing. Make the first sowing of true spinach. Sow short rows or small patches at a time once every three weeks to ensure a continuous crop. It is easiest to sow directly into a well-prepared seedbed. Rake in some balanced fertilizer and water if the soil is dry. Sow thinly into seed drills 1cm deep and 30cm apart. Start the first couple of sowings under cloches in cold areas. Spinach is a useful catch crop. Continue to sow small amounts of true spinach at intervals. Thin the seedlings from earlier sowings to about 10-15cm apart. These can be used in salads. Make one sowing of leaf beet. You can start the seed off in 7-cm pots for planting out later, or sow directly into the vegetable plot. Sow into seed drills 1.5cm deep and 30cm apart. Thin the seedlings later so they are 30cm apart. 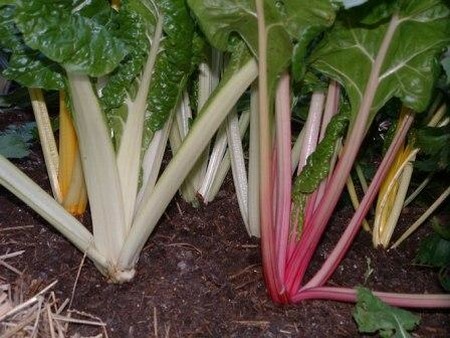 Chard may bolt prematurely in the first summer if sown too early, so wait until April. You can sow directly into containers, aiming for about six plants in a 10-litre pot, or grow individual plants in a 4-litre pot. Each seed will produce a clump of seedlings which can be thinned out later. For a border it may be easier to start the seed off in 7-cm pots and to transplant them later, as you would bedding plants. Allow roughly a 30-cm diameter space for each plant so they can show off their true colors. The earliest sowings of true spinach should be ready for cutting about 10-12 weeks from sowing. It is worth continuing to sow through May, but after that, the weather is likely to be too hot and the soil too dry, and plants will bolt readily. Water spinach by giving the soil a thorough soak once a week to prevent plants from bolting. Keep picking over regularly; this also applies to the young leaves of leaf beet and chard. Leaf beet and chard which has been picked over regularly will benefit from a scattering of high-nitrogen fertilizer to boost further leaf production. Sow a variety of winter-hardy true spinach for an early crop next spring. You can make a second sowing of leaf beet for picking in winter. This late sowing should continue cropping well into the following summer before bolting. 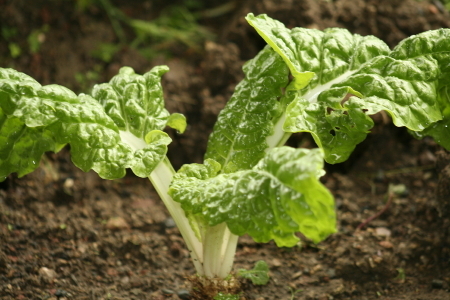 Spring-sown leaf beet and chard should also survive over winter and will provide a couple of pickings in spring and early summer before bolting.